While escorting two inmates-to-be to the Morris Plains asylum, Deputy Sheriff Constance Kopp is forced to pursue one of them into a muddy river when he escapes. But it’s charge number two that’s got Kopp flummoxed – Anna Kayser just doesn’t seem crazy, and when she confesses that it’s her fourth visit to the asylum, each time at her husband’s bequest, Kopp decides to do some investigating. Meanwhile, her boss Sheriff Heath is running for president and while his designated replacement seems all but assured, a rival is now arguing the jail is poorly run and no place for a woman to work. All this, plus a new war-related pigeon project for sister Norma and some glamorous work at the Fort Lee Hollywood studio for Fleurette. Stewart’s excellent fourth entry in this historical series is just the right blend of thrills and humor, and you’ll no doubt be incensed by the period treatment of women. And yes, all the cases are based on true events. Amy Stewart visits Boswell for a ticketed event on Wednesday, August 22, 2018! $17 includes admission and a paperback. Available at stewartmke.bpt.me. Choose from Girl Waits with Gun, Lady Cop Makes Trouble, or Miss Kopp's Midnight Confessions. 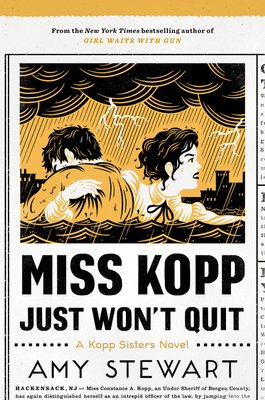 For a fourth option, attendees can purchase admission, cover all taxes and fees, and get a pre-release copy of the forthcoming hardcover, Miss Kopp Just Won't Quit for just $24. That's right! You can get a copy of the latest Kopp Sisters adventure before its release date in September, but this option is only available at the event.